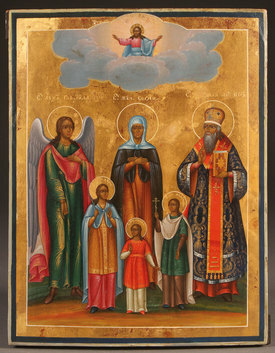 lives of these saints from St. Dimitri of Rostov. Congratulations to everyone celebrating !! the second is more detailed. 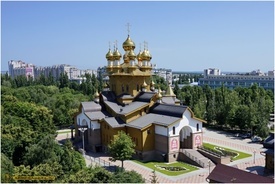 Since Faith and Hope and Love were in truth sacred branches of venerable Sophia, the namesake of wisdom by grace they have shown all men that Greek wisdom is foolishness, and in contest they proved to be prizewinning victors; wherefore, they received a crown that never shall perish from Christ God, the Lord of all. In the reign of the Roman Emperor Hadrian (117-138) there lived a widow called Sophia which in Greek means "wisdom". She was a Christian, and in accordance with her name, she lived her life wisely. She had three beautiful daughters whom she called by the names of the three Christian virtues: the first was called Faith, the second Hope, and the youngest Love. 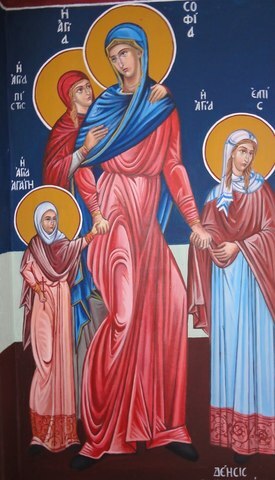 She taught her daughters to live in u way pleasing to God by prayer, fasting and helping the poor. As the children grew in age, so also they grew in virtue, being obedient to their mother, They read diligently and knew well the books of the Prophets and Apostles; they were fervent in prayer and house-work. Their beauty combined with their virtuous lives attracted the attention of many. When the Emperor's servants came for them, all four-mother and daughters-protected themselves with the sign of the Cross saying: "Help us,. O God, our Saviour, for the glory of Thy holy Name." On reaching the palace, they were presented to the Emperor. Seeing their beauty and their bright and fearless f8ces, the Emperor began to ask them their names, they answered that they were all Christians and wished to live for Christ alone Who is to be worshipped by all generations. "Our Father is God Who lives in heaven. He takes care of us and our life. We want to be loved by Him and we wish to be called His true children. Worshipping Him and keeping His laws and commandments, we spit on your gods, and we are not afraid of your threats." The Emperor was very surprised at the courage of these young girls. At this time Faith was 12 years old, Hope was 10, and Love was just 9. The Emperor again tried to force them to worship his false gods. He commanded Faith to offer sacrifice to the goddess Artemis. When she refused she was beaten and tortured. Faith endured all of this evil bravely by calling upon her Lord, and when she was put in a cauldron of boiling tar and oil she remained unharmed. She sat in it as if it were cool water and sang praises to God. Seeing that no amount of torture could force the girl to give up her faith in Christ, the cruel Emperor ordered her to be beheaded before the very eyes of her mother and younger sisters. When the second sister Hope also refused to worship the false gods, she was thrown into a fire, but she too remained unharmed and glorified the true God. The torturer was furious that he could not hurt her and ordered her to be thrown into the boiling cauldron, but it at once melted like wax, and the tar and oil poured out and burnt the bystanders. Ashamed that he was unable to shake the faith of such a young girl, the torturer ordered Hope to be beheaded. Knowing that the same cruel torture awaited her younger sister, Hope encouraged her and said, "Do not be left here, sister. Let us stand together be- fore the Holy Trinity." Then she bent her head and was beheaded with a sword. When the torturer called the youngest sister, Love, to worship the false gods, she also, even after seeing her sisters' tortures, did not hesitate to confess her faith in Jesus Christ. She was ordered to be thrown into a stove, but just like the three youths in the Old Testament, Love remained in the stove unharmed; walking about as if in a cool place, singing and praising God. The Emperor ordered still more cruel tortures, but the young girl proved true to her name for love "endureth all things" (I Cor 13:7). Finally, she too was beheaded and went to join her sisters who stood before the throne of their beloved Lord Jesus Christ. 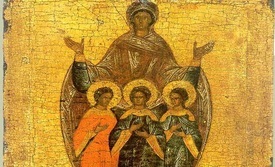 Their mother rejoiced, knowing that each of her daughters had received a heavenly crown. Soon she too passed on to the Lord and shared with her daughters in the heavenly kingdom. 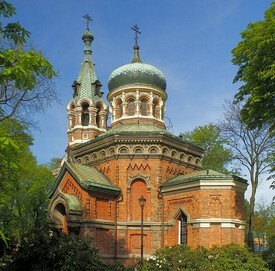 St. Sophia also received a martyr's crown, for, if not in body, at least in her heart, she too suffered for Christ. Seeing their honorable, fair, and fearless countenances, the Emperor questioned the mother as to their lineage, names, and faith. She, being most wise, answered so sagaciously that all were amazed at her prudence. Having spoken but briefly of the maidens’ ancestry and names, she began to tell of Him Whom she confessed and before Whose name every knee should bow. Having confessed her faith in Christ Jesus, the Son of God, she called herself His handmaiden and gave praise to His name. “I am a Christian,” she said, “and in that honorable name I rejoice.” She added that she had betrothed her daughters to Christ so that they might preserve their chastity for the incorruptible Bridegroom, the Son of God. Staying in Palladia’s house, Sophia had sufficient time to instruct her children. She confirmed them in the faith day and night, teaching them with words inspired by God and saying, “My beloved daughters, the time has now come for you to contend for Christ; the hour has arrived for you to be betrothed unto your immortal Bridegroom. In accordance with your names, may you display firm faith, undoubting hope, and unfeigned and never failing love. The hour has come for you to rejoice, for you shall be crowned with the crown of martyrdom by your most beloved Bridegroom and will enter with gladsome voices into His bridal chamber. “My daughters, for the sake of the honor in which you will be held by Christ, Who is more comely than the sons of men, do not spare your flesh. For the sake of life eternal, pity not the bloom of your youth nor hesitate to suffer the deprivation of this fleeting life, for your Beloved, Jesus Christ, Who dwells in the heavens, is eternal well-being and beauty inexpressible. When your bodies have been tortured to death for His sake, He will robe them in incorruption, and the wounds which you bear on your flesh will shine like the stars in heaven. “When you have been deprived of your beauty for His sake, He will adorn you with heavenly beauty, such as the eye has not beheld. When you have laid down your souls for your Lord and suffered the loss of your temporal lives, He will grant you life eternal, and He will glorify you unto the ages before His heavenly Father and before His holy angels. You will be called Christ’s brides and His confessors by all the hosts of heaven; all the holy monastics shall praise you, and the wise virgins will rejoice over you and will receive you into their company. “My sweet children, do not allow yourselves to be deceived by the enemy’s allurements, for the Emperor will entice you greatly and promise you rich presents, offering you glory, wealth, honor, and all the beautiful and sweet things of this corruptible and vain world. But love none of these things, for they all vanish like smoke and are scattered like dust by the wind and like a flower or grass wither and return to the earth. Neither be daunted by the prospect of grievous tortures, for having suffered them but a short while and having overcome the foe, you will rejoice forever. “I believe that my God, Jesus Christ, will not forsake you should you resolve to suffer for Him, for He said, Even if a woman should forget her offspring, yet I shall not forget thee. He will remain with you throughout all the tortures you will suffer, looking upon your struggles, strengthening your infirmity, and preparing a plaited crown for your reward. Hope then kissed her sister Love, who had been watching her torture, and she said to her, “Do not linger here, sister, but hasten, that we might enter the presence of the Holy Trinity together.” Then she went to the headless corpse of her sister, Saint Faith, and kissed it lovingly. Nature compelled her to shed tears, but love for Christ turned her tears into joy. Then she bowed her head beneath the sword, and thus Saint Hope was beheaded. Her mother took her body and glorified God, rejoicing over the courage of her two daughters. She then inspired her third daughter with sweet words and wise counsels to contest in like manner. 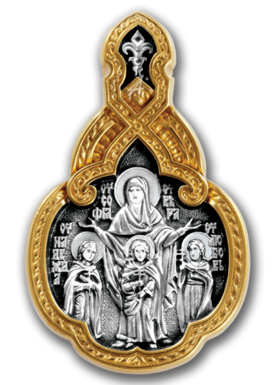 O holy and righteous Sophia! What woman hath been thus saved through childbearing as thou, who bore children who were betrothed to the Savior and suffered for Him and now reign and are glorified together with Him? In truth thou art a wondrous mother, worthy of remembrance, for having beheld the cruel and bitter torments which thy beloved children underwent and their death, thou hast not, as is the custom with mothers, suffered grief, but thou dost rejoice, comforted by the grace of God. Thou didst encourage them to accept martyrdom and to pray, that they might not weaken and preserve their fleeting lives but that they should instead resolutely offer to shed their blood for Christ. And now exulting in the vision of His most radiant countenance, together with thy holy daughters, do thou enlighten us, that we may be preserved in the virtues of faith, hope, and love and be deemed worthy to glorify and stand in the presence of the most holy, uncreated, and life-bestowing Trinity, unto the ages of ages. Amen. 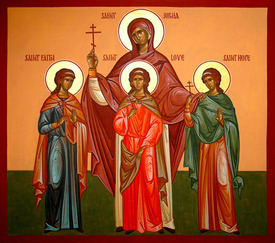 Bulgarian: Вяра, Надежда и Любов (Vyara, Nadezhda and Lyubov), are a group of Christian martyred saints. Their mother is said to have been Sophia (Greek for Wisdom); Sapientia (Latin for Wisdom). The names are also the words designating the three key Christian virtues mentioned in Apostle Paul's First Epistle to the Corinthians (1 Corinthians 13:13). In the year 777 their relics were interred at El'zasa, in the church of Esho. There is a common misconception that the capital city of Bulgaria, Sofia, is named after Saint Sophia the Martyr, and so the city's holiday is on September 17. 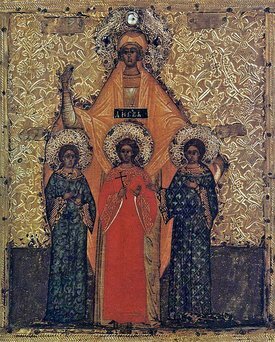 Sofia is in fact named after its ancient cathedral church of Saint Sophia, consecrated not to the early Christian martyr but to the Divine Wisdom of God (Aghia Sophia in Greek). 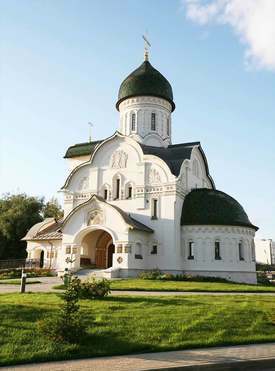 There are several icons of St. Sophia the Martyr and her daughters in that church, though. As a sacrifice to Him, she offered three most-beautiful daughters. And be not afraid of torture or bitter misfortunes. God will give you wonderful bodies in heaven. As the daughters of the King of kings! Do not grieve over life-what is this earthly life worth? Its span is at most a hundred years. Life without end, life without beginning. For the company of wonderful saints awaits you there. Flew swiftly to the bosom of Christ. And our merciful God receives their prayers. 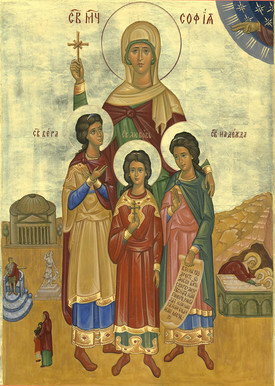 The Church celebrates and rejoices in the feast of the three daughters: Faith, Hope, and Love and their Mother Sophia, named for her wisdom: for in them she gave birth to the three godly virtues. Now they eternally behold their bridegroom, God the Word. Let us rejoice spiritually in their memory and cry: O our three Heavenly Protectors, establish, confirm and strengthen us in Faith, Hope and Love. 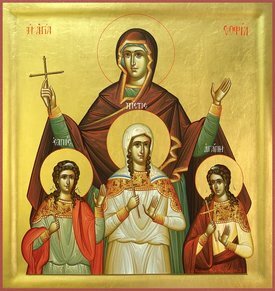 You blossomed in the courts of the Lord as a fruitful olive tree, holy martyr Sophia; in your contest you offered to Christ the sweet fruit of your womb, your daughters Faith, Hope, and Love. Together with them intercede for us all.